Dream it. Plan it. Live it! It’s been close to 4 years since becoming a professional blogger. Wow, time flies. It seems just yesterday I handed in my resignation and said “see ya!” to my soul-sucking state job. What a great day that was! Anyway, the other day I was reflecting on the last four years and thinking about how much my life has changed for the better. Honestly, I still pinch myself because I can’t believe this is my life -my life that I CREATED! With that said, this post is going to be a little different from your typical “how to blog” post. I know you might be chomping at the bit to learn about affiliate marketing, sponsored posts, social media, or how to pick the perfect blog niche but today I want to share the different ways my life has changed as a result of following my dream – and it goes way beyond the money. If you want to learn to start a blog then check out my step by step tutorial. Thanks to blog income reports most people interested in blogging most likely understand the potential blogging offers. They see some professional bloggers making well over 6-figures a year and even some bringing in 1 million or more. It’s easy to fantasize about all the different ways that kind of money could change your life. However, until you actually become a professional blogger, and live the blogging lifestyle, it difficult to truly understand the different ways blogging can totally change your life. Personally, I think this topic is equally important as the other blogging information out there. Why? Because it’s proof that you can create a successful money-making blog out of nothing but a dream, hard-work, and persistence. Accomplishing this goal will change your life for the better – it changed mine. Many think we must accept the cards that life has dealt us. The old school mentality is that you choose a career early on and that’s what you’re stuck with for eternity. Leaving a professional career midstream is considered very irresponsible. Think about it. There are so many people that work 30 – 40 years at one job. That’s where they started at 18 and at 65 they collect their gold watch and live out their golden years, hopefully. Whether they hate their job, or love it, that’s where they stay until the end. By no means am I criticizing this way of life. It works for many people. Not everyone is cut out to be an entrepreneur (or even has the desire to be one) just like not everyone can be a teacher, scientist, daycare worker, or surgeon. I actually have the utmost respect for hard workers regardless of their occupation. However, I have a different thought process. I believe you can switch gears at any time. Sure maybe you went to college, or worked your way up the ladder, but that doesn’t mean you’re chained to that decision forever. Things change. You change. Life changes. You can decide to create a different life at any moment. I’m not saying it’s easy or doesn’t come without risk or mistakes. All I’m saying is if you want a different (better) life you’re in control of that. August 2014 is when I decided to make the leap and quit my full-time job to start my new life as a professional blogger. Of course, I didn’t just wake up one day and say “take this job and shove it”. Ha, I wish! Nope, I did a lot of planning and thinking before that day came – so when it did, I was ready. That decision was one of the best of my life. Not once have I looked back with regret. Since then my life has been what dreams are made of. Yes, I work hard every day but now I live life on my terms. Okay let’s get the money part out of the way. Like I said, it’s easy to look at income reports and be starry eyed with the big numbers. However, let’s take a different look at the money. No matter how you slice it, dice it, or fry it we all need money. It’s what makes the world go around. Whether we like it or not it’s just the way it is. Bills need to be paid, kids need to be fed, and if you want to have extras like vacations, dinners out, or random Amazon purchases then you need money. Unfortunately, those things don’t pay themselves. Let me take step back. My state job required me to have a Master’s degree – which I still have the student loans to prove. I also had years of experience. When I quit I was making 40k a year. Like many state and private sector job, there was no room for advancement and getting even the littlest raise was an act of god. No matter how hard I worked I would never make more money. Maybe I’d get a pat on the back at a staff meeting but again that’s not gonna pay the bills. That was very discouraging because I’m a worker. I like to work hard AND see the results of my hard work – that wasn’t going to happen where I was. As a professional blogger I now make triple+ the money I did in my state job. However, it’s not about the “things” money can by – at least, not for me – it’s about the freedom and peace it provides. No longer do I live paycheck to paycheck. I don’t feel stressed out wondering how we’re going to pay for extras or if there’s an emergency. I know that I can provide for my girls now and into the future. If the gutter falls off the house we can fix it without putting it on credit card, taking out a loan, or refinancing the house. It’s so peaceful to not worry about money. This isn’t to say I live extravagantly, because I don’t. Of course, I do indulge in some extras because I’ve worked hard for it. But I still budget, save, and stay responsible with money. This is huge. Of course, I knew I wanted to make money but, more importantly, I needed a lifestyle where I could be there for my family at any time. That’s what professional blogging gives me. I can work whenever and wherever I want. I can type blog posts using my phone while waiting for them at their school, at Panera enjoying a salad and coffee, and/or in the comfort of my home. I can take days off whenever I need too. 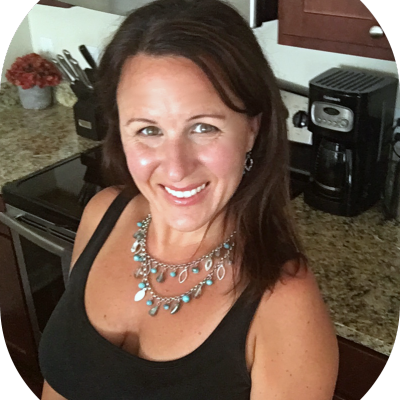 I’m able to manage a home, take care of my kids, and work on my business with ease. I don’t have to deal with being chained to a desk or an unreasonable boss. The flexibility of professional blogging is priceless. #3. Gave me a confidence I didn’t even know I had. It’s not easy to follow your dreams. Often you’re filled with self doubt, people are skeptic about your every move, and then there’s all the risk involved. However, as you persevere through all of that, and make it to the other side, you develop a confidence that you didn’t even know you had. That’s exactly what happened to me. I did it. I took a dream and turned it into reality. Now I feel like I can accomplish anything I set my mind too. I feel good about myself. I’m proud of the person I became as I worked towards my goals. One of my favorite quotes is “it’s not the goal that changes you, it’s the person you become as you’re working towards that goal”. This couldn’t be more true! You might be surprised to know that I struggled my whole life with school. I wasn’t the smartest and it was difficult for me to stay focused and process information. Back then, I went to Catholic school, and didn’t get any type of classification or extra support. All I got was grounded when I brought home bad grades. It was a struggle from Kindergarten through High School. But I made it. Honestly, it’s amazing I even have a Bachelor’s or Masters degree. I didn’t graduate with honors – not even close – but I did graduate. I didn’t have the brain smarts but what I did have was the work ethic, drive, and persistence. I never gave up. I also had a survivor mentality – failure was never an option. I knew that if I wanted a better life the only person that would give that to me would be…me. This kept me going. Anyway, building a successful 6+ figure business has given me a confidence like no other. I was able to succeed despite all of the challenges and roadblocks in my way. This has made me fearless and I love it! #4. I found out what I was made of. Building a business isn’t easy. There are so many things that can and will go wrong – personally and professionally. In order for my business to succeed, and thrive, I need to function effectively in stressful situations. I need to be resourceful and make quick decisions. I need to work when all I want to do is stay in bed. I need to be extremely disciplined in getting work done and staying focused. Like I said before, all of those things never came easy to me so being able to dig deep and become this person showed me what I was made of. #5. It’s made me beyond grateful. Everyday I wake up and feel so grateful for the life I live. I strongly believe in what you give to the universe you get back. So while I worked hard for everything I still show my gratitude daily to the universe because I’m not entitled to anything and I know nothing in life is guaranteed. I’ve never been happier and I’m so grateful for everything. A couple years into starting my blog – when it was turning into a business – I had a few people really doubting me. They would tell me things like “owning a business is too hard” or “you’ll work too many hours” or “you already have a steady job, why would you quit” or many other similar statements. Sometimes it was really difficult to stay focused on my business when people close to me were so doubtful. But I stayed the course. I believed in myself and the vision to be my own boss. Glad I did. Now that I’m working as a professional blogger, and see that all of their statements were false, I see their doubts were about their abilities to be a business owner not mine. #7. I don’t have to settle. I think one of the most important lessons I’ve learned from building a successful blog is I don’t have to settle for a life I don’t want. I was unhappy with the job I had. Sure it was steady, had benefits, and a pension but it literally crushed my soul. I’m an entrepreneur and need to be creative. I felt very chained down in my job. Not to mention I was stressed all the time over money. It sucked! However, I felt because I went to school for so long, had so much in student loan debt, and because everyone was telling me to stay where it was “safe” that I had to settle for what I had. But I believed there was a better way – a better life. And I was right. Today, I know I don’t have to settle for anything that I’m not happy with. This isn’t to say I don’t compromise or feel content – trust me, I do. But if I’m ever in a situation where I feel miserable then I know if I’m willing to work for it then I can make a change. I guess this goes along with money but it’s a little different. I love being able to provide financially for my family. It gives me purpose. I enjoy knowing my family is benefiting from my hard work. This makes me work harder. This one goes without saying but working for myself is the absolute best! I create the vision for my business. I decide on the goals and tasks for the month. I don’t have to deal with sitting in countless mind-numbing committee meetings with people going over the same things over and over again with zero results. I know that the harder I work the better my business will be. As the boss I get to see results. Of course, being self-employed comes with it own challenges. For example, taxes and health care are a pain. Oh, and you need to be self-disciplined so your days are spent working and not in pajamas watching Bravo all day. However, the benefits to being your own boss outweigh any possible negative – at least in my opinion. 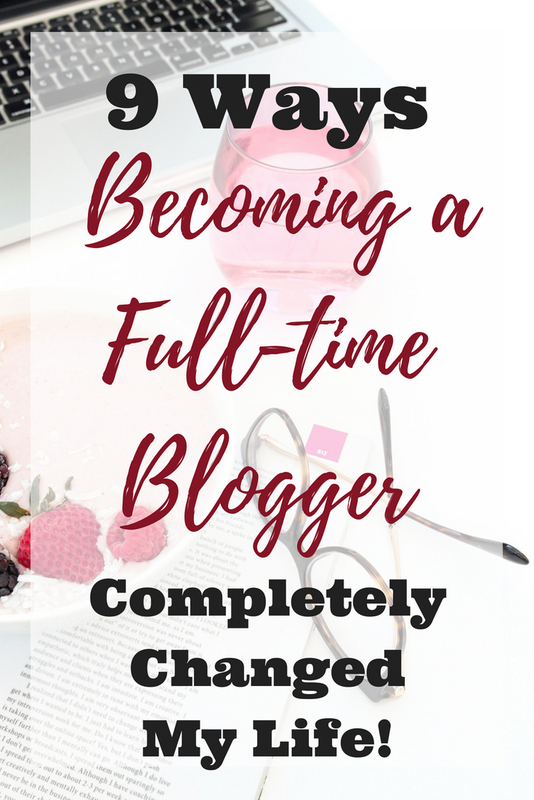 Honestly, I can go on and on about the ways blogging completely changed my life. The last thing I’ll say is this – I’m a different person than I was 4 years ago when I left my old life and step into this one. Starting a blog was the best decision of my life. If you’re on the fence with starting a blog I hope you find inspiration in this post. Yes it takes work and time to make a full-time income from blogging but it is possible. If I can do it, so can you! 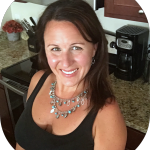 Creating a blog was the best decision of my life! If you’re interested in starting a blog of your own, I created a tutorial that will help you step by step start a blog of your own. Take that first step and get your blog started. I'm Tammy! When people ask what I do I for living I say - I'm a professional blogger, content creator, and entrepreneur. When they look at me weird I then say - I make money online! When they ask how, I point them here! I'm the owner of Big Boss Moves and Organize Yourself Skinny. If you want to learn how I built a 6+ figure blog, and life I love, then keep reading! I'm Tammy! I quite my cushy state job in 2014 to live my dream of becoming a professional blogger and entrepreneur. I make 6+ figures a year working from home, doing a job I love, and being there for my family. I started Big Boss Moves to share my experience with building a success blog from nothing more than a dream. If I can do it, so can you. If you want to learn how then keep reading. Read More About BBM..
Beginner Affiliate Marketing: The Advice I Wish I Got Years Ago!